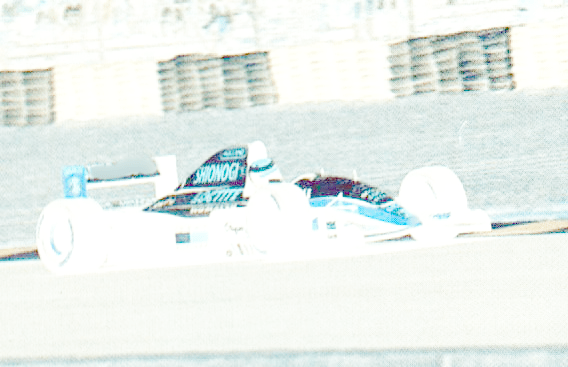 Last week’s question(s): Sticking with the prehistoric theme, can you name the driver and team in the photo. How many F1 races did the team compete in and how many did they win? The answer(s) I was looking for were: The driver in the photo is Heinrich Bücherl driving a Eurobrun ER189 at the Hockenheim Historic 2011 – in memory of Jim Clark. They entered 46 Grand Prix (with 76 entries) but only qualified for 21 of these. Of those 21 they only finished in 8 races. Their best place was 11th at the Hungarian GP in 1988. The car originally belonged to Oscar Larrauri who had won the Formula 3 championship in 1982 driving for the Euroracing team but at the rapidly advancing age of 33 he still hadn’t managed obtain a drive in Formula 1. He was driving Porsche sports cars run by Walter Brun and he was getting desperate – so he got Brun and Euroracing together and they formed the Grand Prix team – Eurobrun. There was no question about who would be their first signed driver. Brun had the fortune, made from building slot machines, and Euroracing had the skills – they had dominated in F3 in the early 1980’s and they had won the championship with Michele Alboreto in 1980, Mauro Baldi in 1981 and Larrauri in 1982. Euroracing had also been responsible for the Alfa Romeo chassis of the early 1980’s so it seemed a perfect combination of money and experience. Eurobrun first entered F1 racing in 1988 – a very good year – Prost and Senna were fighting it out neck and neck for the championship, winning all but one race between them, while Eurobrun were fighting every week with Zakspeed to try to keep out of bottom place on the ladder. They did manage to qualify for most of the races in their first year, but their car was reliable only it its unreliability and they rarely managed to see the chequered flag (even from multiple laps down from the race winner). The car was slow, based on a 1984 chassis that wasn’t competitive even in 1984, it didn’t have an airbox, and there was no money for spare parts which resulted in frequent mechanical failures. Their drivers had to try so hard to be competitive that they frequently crashed. For 1989 they would have a new car…sometime…and it finally arrived in time for the German GP. And it looked amazing, sporting the bright orange livery of its new Jägermeister sponsorship. It was a car that looked good enough to win, but unfortunately you have to have more than good looks to win in F1. Brun obviously had superior salesman’s skills to persuade Jägermeister to part with some money. They would run only one car, but despite saving money by only having to buy half the machinery and pay only one driver they didn’t manage to qualify for a single race. This year Zakspeed beat them by managing to qualify for two races, but retired from both. Euroracing had the sense to see that there was no use in continuing to throw good money after bad, and stopped putting in the funds to try to make a silk purse out a sow’s ear. Jägermeister quickly realized they weren’t going to get much exposure for their sponsorship money and by the end of the season they and their money had departed. At the Australian GP the car was once again sponsorless with plain black livery – appropriate for the team’s funeral atmosphere at the last race of a season where they had failed to qualify for a single race. Well done to Johnny, Jim, Taflach, Milestone11, Tim, Toleman Fan, AV2290, CTP, Cassius42, Dave, Clyde and The13thDuke! This week’s question(s): Can you name the driver, team and race in the photo. How many races did the team win (in the season) and who was the team drivers for the season?